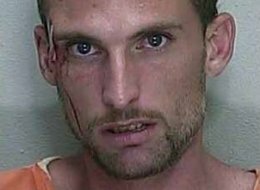 Police say a Florida man is accused of leaving his three children in a car for hours outside a bar while he got drunk inside. A police report says an officer found 28-year-old Joshua Delong outside of Dr. B’s bar in Ocala just after 2 a.m. Thursday with a bleeding head. A security guard told officers that an angry patron punched Delong before he was arrested on child endangerment charges. Witnesses told police that Delong left his children ages 5, 7 and 8 in a gold Cadillac parked outside while he drank at the bar. Police say the kids were honking the horn and calling for “daddy” and that the bar’s security guard eventually called police when he tried to drive away with the kids. No phone listing could be found for Delong, and it was not known if he had a lawyer.